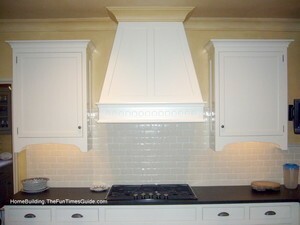 A subway tile backsplash is about as simplistic as it gets when it comes to classic design choices for kitchens. Clean lines and simple patterns combined with easy cleaning and durability make this a popular choice for many homeowners that desire a good value. Subway tiles have been around since the artistic team of Heins & LaFarge first installed them in the New York City subway system back in 1904. They were part of the Arts and Crafts movement and worked in the Beaux-Arts architectural style. Subway tiles come in a variety of sizes and colors — which is in sharp contrast to its humble beginnings when white and black were the standard. Classic subway tiles are 3″ x 6″ but they come in a variety of sizes now. The kitchen shown in the photo above is from the English cottage that I chronicled in Marietta, Georgia. If you have a few minutes, I invite you to check out some — or all — of the articles in that series. It is a full-blown English cottage, built by Jerry Bonner, that was constructed of the finest materials with extraordinary attention to detail. 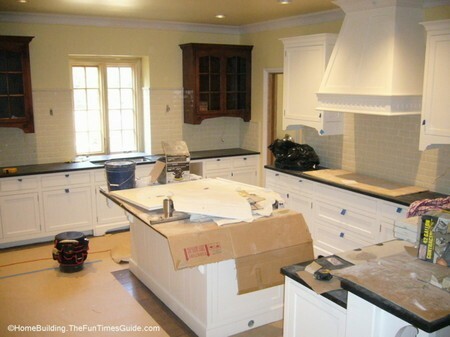 The subway tile backsplash that was installed in this English cottage-style home was paired with a black, brushed granite countertop and off-white cabinets. As you can see, it’s an awesome combination! It will most likely never go out of style. Having first laid eyes on it back in 2006, it’s a beautiful site to see in combination with all of the custom, built-in cabinetry. When subway tile was first introduced, they were made of painted and fired ceramic. That’s not so today. Various polymers have been introduced to the mix for additional durability and strength. For something a little bit different, yet still the same, consider trying crackle glaze subway tile.